We currently have some glass bead counters for sale and proceeds help to support our site. You can place an order via the Paypal Shopping basket or alternatively you can email info@mtgtwincast.com with details of your order and payment arrangements. 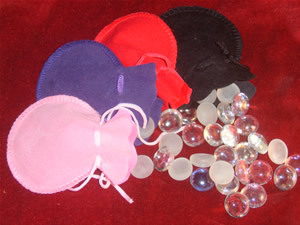 We have some lovely Glass counters up for sale and they come in elegant Velour Bags, in either Black, Purple, Red or Pink. Ideal Christmas presents and an excellent acessory for any magic player's collection. At the moment available colours are Blue, Misty Blue, Green, Misty Green and colourless/white or misty white. If you have a preference or would like a mixture, then please let me know with the order. Otherwise you will receive whichever I think look best!